UPDATE AT 6:50 A.M. 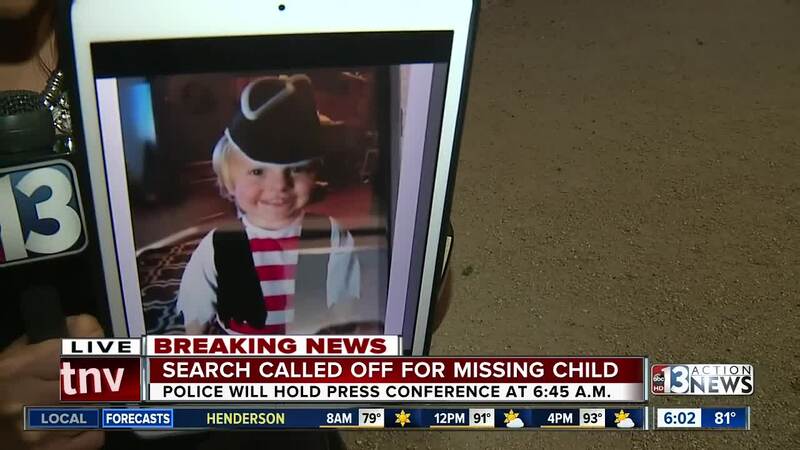 According to Las Vegas Metropolitan Police Department's Lt. Ray Spencer, the search for the missing 3-year-old boy has turned into a homicide investigation. Spencer said a 911 call was received from a 20-year-old woman on Sunday morning who reported she went to park with the child, who was identified as Daniel Theriot. She claimed that her child walked away while she was on the phone. At about 1 p.m. Sunday, police began doubting the mother's story, including wondering if the child was ever at the park. A criminal investigation was launched at that time in addition to the missing person investigation. 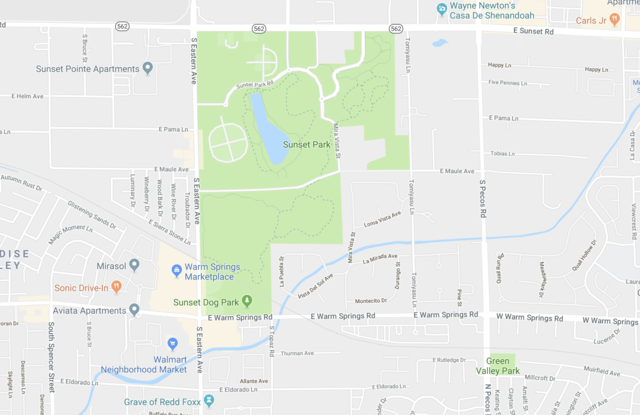 One of the reasons they doubted the story was because the woman lived within walking distance of Lorenzi Park but chose to go to a park several miles away. The child's body was located in a remote area near Lake Mead early Monday morning. Police have arrested the mother and her boyfriend, a 40-year-old male. Police say that the manner in which the child was killed was "absolutely disturbing" and there is "nothing accidental" about the death of the child. Police believe the child was killed within 12 hours of the initial report of the child's disappearance. Lt. Spencer also said that a 2-year-old child was removed from the couple's home and they will also be charged with abuse of that child. The case is similar to that of a 3-year-old girl reported as missing on Aug. 23 . The child's mother, Aisha Thomas, claimed that her daughter disappeared on a walk to a nearby grocery store. The child's body was found in a duffel bag in a closet in the child's home. Lt. Spencer referenced the death of that little girl during this morning's press briefing. UPDATE AT 5:20 A.M. SEPT. 3: Police are no longer actively searching for the 3-year-old boy who was reported missing at Sunset Park on Sunday. No reason has been given at this time. There will be a media briefing at 6:45 a.m. today. UPDATE AT 6:30 P.M. Las Vegas police tell us that they are bringing in equipment to search the pond at Sunset Park. 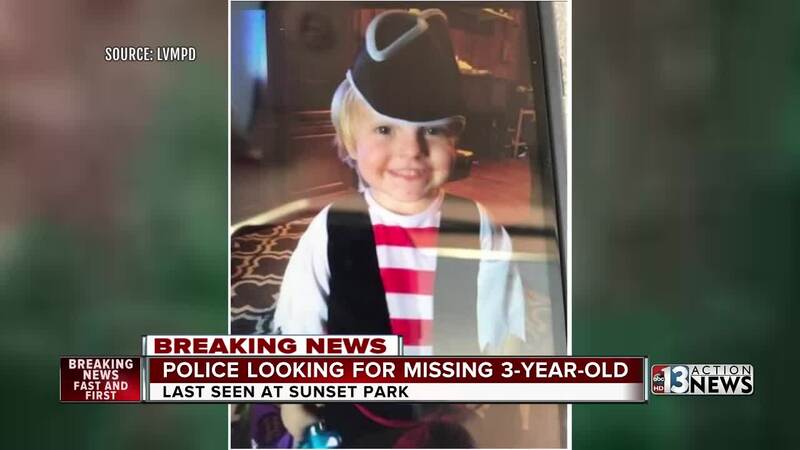 UPDATE AT 2 P.M. Las Vegas Metropolitan Police officials have released more details about the 3-year-old boy who went missing from Sunset Park Sunday morning. 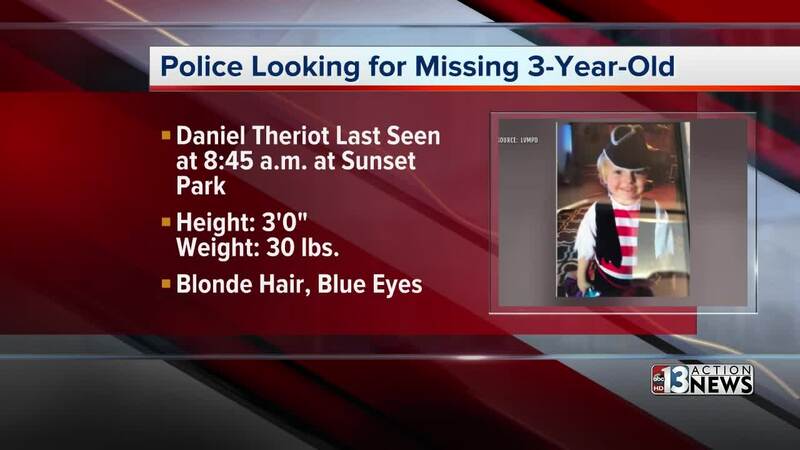 Daniel Theriot may be suffering from emotional distress and require medical attention. He is a Caucasian male last seen wearing a red t-shirt with a Lightning McQueen logo along with red and black plaid pants. Anyone seeing the child is asked to call 702-818-3111. Sunset Park remains closed as the search for the child continues. Sunset Park is comprised of 300 acres with a 9-acre lake, 3.5 miles of trails, playgrounds, a dog park, softball/baseball fields, tennis courts and more. It is located near McCarran International Airport on Sunset Road. 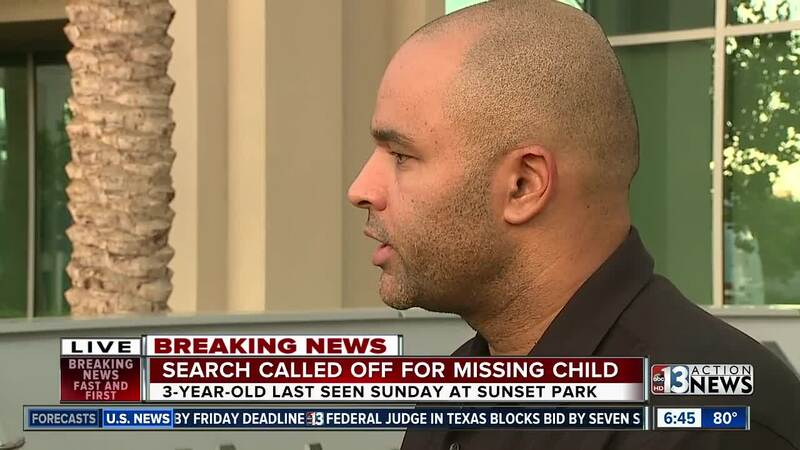 Officials have closed Sunset Park as Park Police and Las Vegas Metropolitan Police search for a missing child. The 3-year-old boy was reported missing at around 9:19am Sunday. Officials have not provided any other details at this time.